If you think Maui is all about palm trees, pretty beaches, and pineapples, think again. Maui’s not Texas, but we do have our share of ranch life and history. Local cowboys are called “pani’olo” a term derived from the Mexican cowboys who taught local workers how to ride horses and take care of cattle, although some people dislike that term. Of the Hawaiian Islands, both Maui and the Big Island have the strongest pani'olo (pronounced kind of like "pah-nee-oh-low") influence. Upcountry Fair in Olinda. There's even a "Cowboy Church." 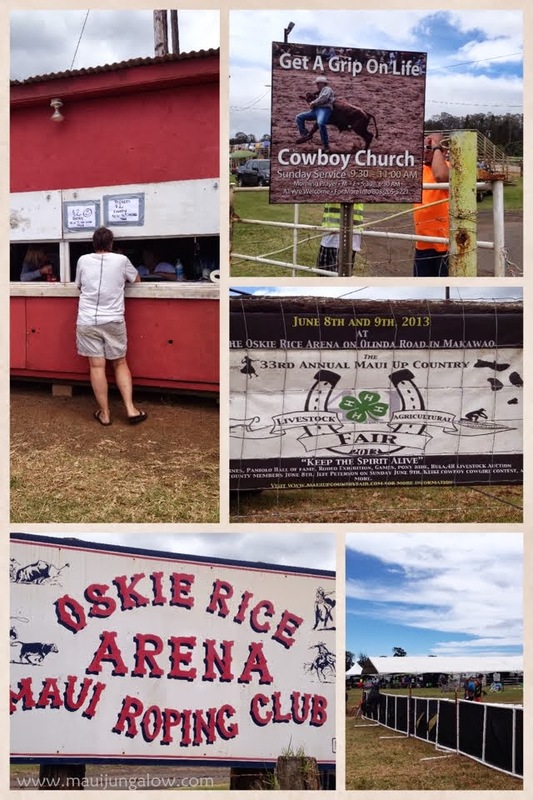 One of the best places to get a taste of Maui ranch life, besides the Annual Makawao Rodeo, is the Upcountry Fair in June. What makes the Maui Film Festival so unique, and is perhaps its most distinctive feature is the Celestial Cinema. Watching films on a large screen under the night sky filled with stars. It is the image that adorns the film festival brochures every summer. It is what my friends rave about. The paradox is that the Celestial Cinema, this celebrated outdoor theater, is also so challenging… kind of like the 5-star Wailea Golf Course which hosts it. The beauty is that the event is outside under the starry Maui sky. The difficulty is that the event is outside under the starry Maui sky. The film festival brochure for 2013, graced by a big photo of the Celestial Cinema in Wailea. Photo I think is by Randy Jay Braun, an outstanding Maui photographer. 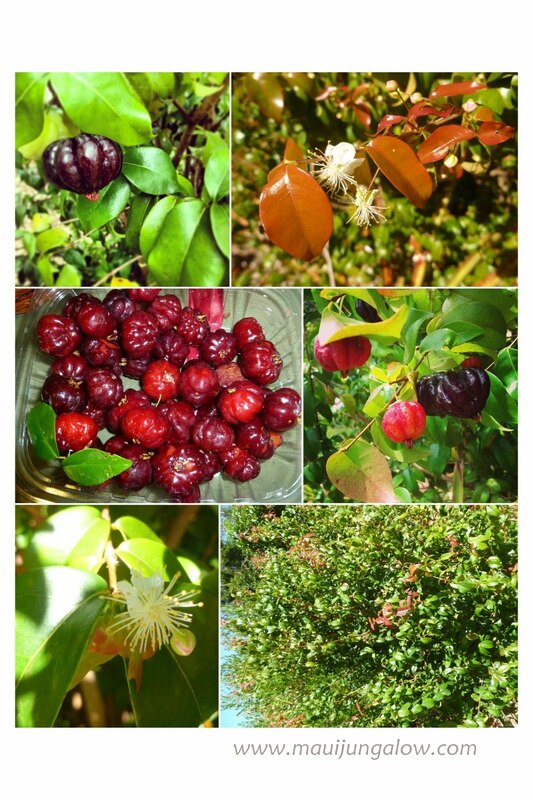 During the height of Surinam cherry season, some artist friends brought over a delectable fruit relish that they like to spoon over fish. They referred to it as "Michael's Amazing Surinam Cherry Fruit Bowl." It’s incomparable to anything I’ve had. Sweet and tart and juicy, not cooked like a chutney, and with complex layers of flavor. Even DH, who is not generally crazy about sweet things, ate several helpings. It's kind of like a salsa, but fruity! I was fooled by this dish and thought it had some tomatoes, because of the juicy red pieces, but they were actually sour-sweet Surinam cherries. I actually thought this was a variation of a fruity tomato salsa. Surinam cherries are still fruiting now, though the ones I have access to are not producing as abundantly as a couple of months ago. These are lighter colored surinam cherries. They are very ripe and a bit tart. Surinam cherries are not like regular cherries. They taste different as well, more wilder somehow, like a wild berry. They are about the same size as a regular cherry, with a medium pit inside. They are delightfully grooved and can have a tart taste. Usually, the deeper the red, the sweeter the fruit. Lighter colored Surinam cherries can make you pucker up! Here's a collage of surinam cherries in various stages of growth, including flowering. When they are going off, I mean, producing a lot, you can end up with a lot of these little beauties. These big bushes seem to love Hawaii’s mild climate and I have seen them growing in lower Kula, along the side of the mountain, and also in Haiku, about 800 feet above sea level. They can be made into preserves and juiced, and used in a lot of ways, but this is the first time I’ve had them over fish. This is also a great way to use up lighter colored Surinam cherries. This adaptable recipe is from Michael and Karen O’Reilly, who express their art in many ways, including in the kitchen. I wrote about a visit to the O'Reilly art studio during the Maui Open Studios. Very challenging to take photos of food! I hope I've done this dish justice! The smaller you chop the ingredients, the more flavors you’ll taste in one spoonful. I would try to keep my pieces no bigger than half an inch, and would cut the celery, pepper, and onion more finely than that. Mix all ingredients together and as Michael says, “I just make it to taste - kinda wing it or make it up as you go along...” It’s a very flexible recipe, and you can adapt the amounts to your liking. Michael says it is great over salmon, but you can certainly try it with other kinds of fish to kick up the flavor. I also enjoyed spooning it out of the jar by itself. It’ll last for a couple of days in the fridge. 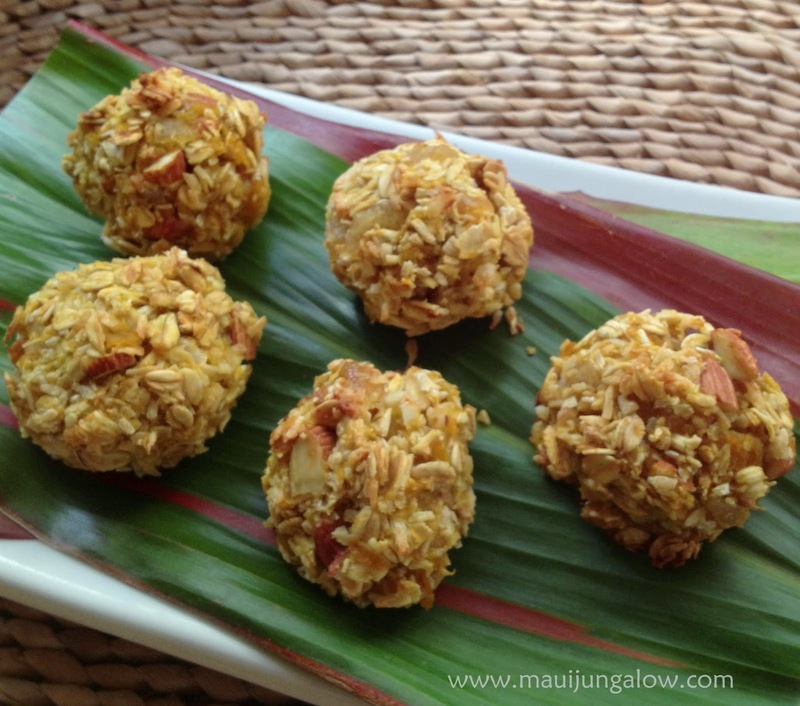 This recipe is also vegan, raw, and gluten-free. Enjoy! Hana to Maui is what Maui is to the rest of the world. Maui is an escape from the hustle and bustle of everyday life. Hana for Mauians is an oasis from the grind of Maui life. Incomprehensible to think that Maui is other than a perfect paradise. But even on Maui there are distractions and tasks: cell phones, to do lists, honey-do lists, family stuff, emails, internet troubles, meetings, termites, and that four letter word… W O R K. You didn’t think we sat at the beach all day? There is Hana and then there is the road to Hana. Both are legendary. Sure, you can fly to Hana (easy peasy) or take a boat (difficult to arrange and I don’t know anyone who does this), but most people drive there. Some people may even bike the road to Hana, but…I hope they are well-insured. 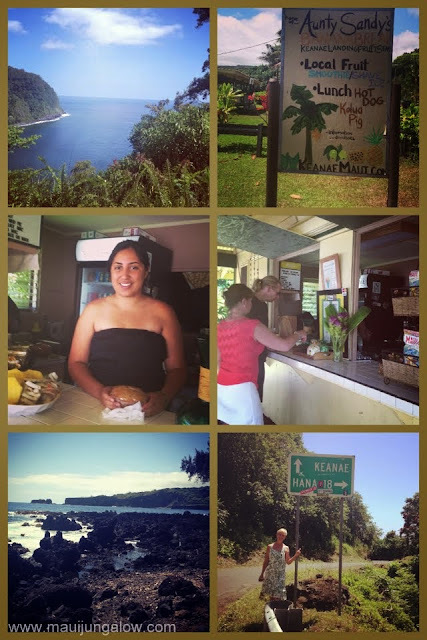 A month ago, exactly today, I toured the road to Hana with some other Maui bloggers and social media peeps in a VIP style, air-conditioned bus operated by Valley Isle Excursions. Full disclosure here: The tour was offered free by Valley Isle with the hope that we would provide good publicity and social media coverage. Travaasa Hana paid for our lunch there and gave us a tour of their resort for the same reason. BTW, Travaasa is not included with the standard Valley Isle Excursion Tour. Moreover, snacks and tips were included and we were given a free CD of the Road to Hana. This trip was arranged by Maui Information Guide and assisted by @erikblair. Moreover, a carrot was dangled in front of us: the best instagram photo of the Road to Hana, the one that most captured the essence of the Road to Hana, would win a $50 gift card. We were also encouraged to tweet using the hashtag #HanaTrip. As the reader, you are asked to employ your powers of reasoning and realize there is some inherent bias here. Enough said. I love Hana and the road to Hana so much that it’s really hard for me to do just one post on this excursion. I can’t do it. So this will be the first in a 7 part series. Some of the posts will be on my blog and a few will be posted as guest blogs. I will let you know where and when. Hana - it looks closer than it really is. Why is the Road to Hana so legendary? · It’s windy and sinuous, full of sharp s-curves and old one-lane bridges. It's very narrow in many places. · It’s beautiful. Even on a cloudy or rainy day, it is still magical. There are unexpected panoramas and vistas. 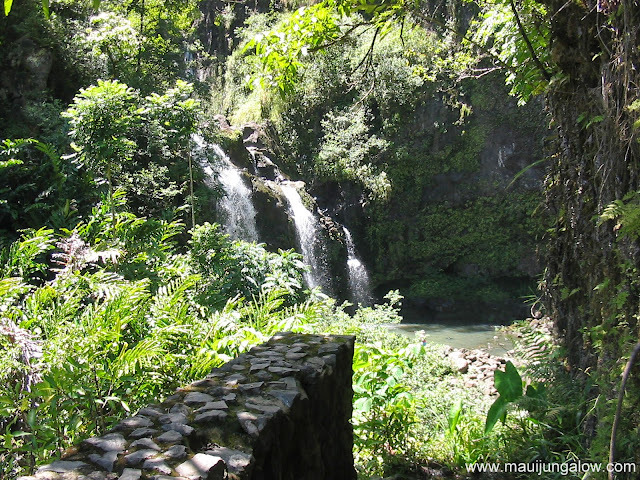 There are waterfalls along the side of the road, hiking trails and paths to explore, fruit stands to visit, quaint shacks and jungalows to gaze at, while passing by. · It invites you to slow down and enjoy the moment. The Road to Hana is not about getting to Hana, but about the journey. Although Hana is still pretty amazing too. · There is nothing like it on earth. I’m sure that there are other magical roads around the world, and I haven’t traveled everywhere, but this road is like a road that goes back in time, to a less developed Hawaii. There is nothing like it on any of the islands. Yes, there are plenty of tourists on the road to Hana, but there are no golf courses, big resorts, strip malls or McDonald’s. 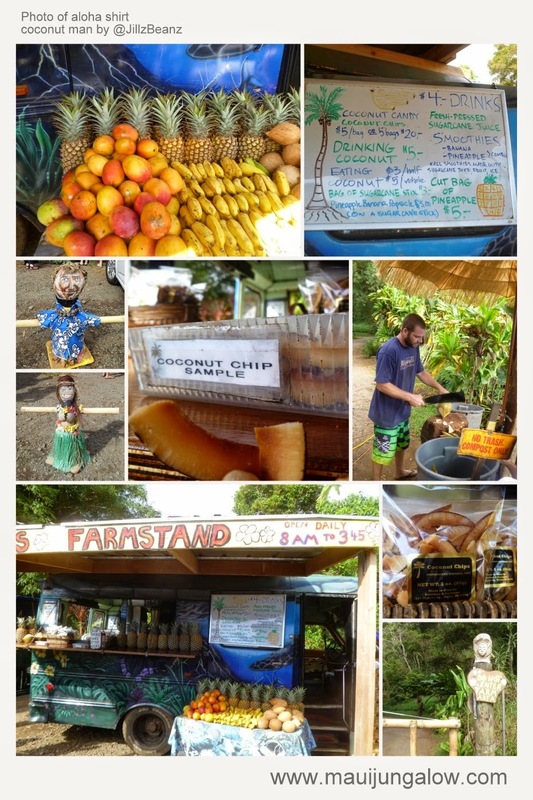 There are no gas stations on the Road to Hana, so fuel up before you go! Nothing like the excitement of driving the Road to Hana. So glad I wasn't driving a bus full of distracting Social Media peeps. 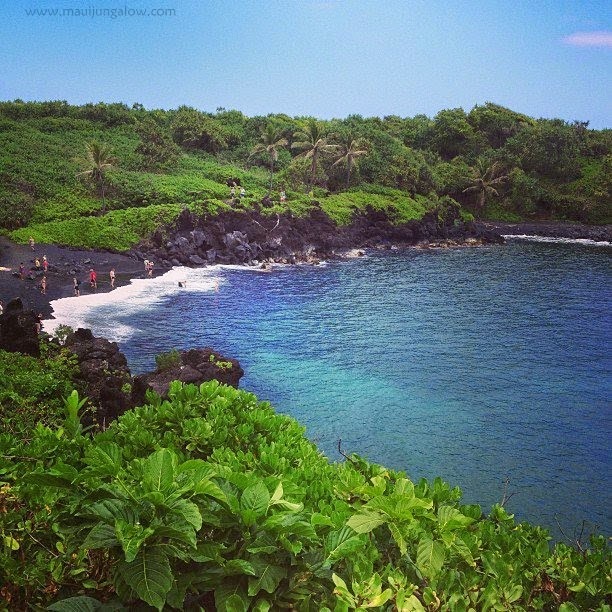 Is the Road to Hana a must-do? · The road is very curvy, and some people can get motion sickness. If you are a sensitive person, you may want to be the driver and control the pace of the trip, go on a tour which I had to admit, was very comfortable and smooth, or not go at all. · It is an all day trip. Don’t go for a few hours and think you can do some other big activity on the same day. · If you don’t like scenery and nature, it may not be for you either. DH enjoys travel but is not a sightseeing kind of tourist. He could go on the Road to Hana once a decade and be perfectly fine. I could go almost every weekend. Wailele Farms, better known as Twin Falls. Our smoothie stop. @MauiMamala and @Maui Carmel pose in the bottom picture. More pics of Twin Falls. Ke’anae Peninsula – About halfway to Hana. A side road takes you down to the ocean, with more views and lava rocks. Aunty Sandy’s banana bread stand is here. On the other side is the Ke’anae Congregational Church. Beautiful Ke'anae. Hard to resist buying banana bread from Aunty Sandy's. @RoxanneDarling posing in front of the sign. Waterfalls and Ching’s Pond - Every one-lane bridge offers an invitation to step out of the car, look over the bridge to see if the stream is running, and hike uphill to find a waterfall. Some streams are very full and others nearly dry. Some tourists I met recently shared a story of going on the Road to Hana this spring during the drought. They stopped near one of the bridges and were so disappointed that there was no water flowing, that the driver cussed, “Where’s the f’’ing water?” and there was a big roar, and water started gushing into the dry stream bed. In a few minutes, it was completely full and he said he was so grateful that they weren’t along the stream bed when it happened. He said it was the most amazing experience to watch the stream bed fill up with water. I don’t know if this was an irrigation dam that was released, or what, but it’s definitely a strange incident. One of the most well-known waterfalls is right on the side of the road, Waikani Falls aka “Three Bears Falls” because it usually makes three parallel waterfalls. Hana style bridge, Waikani Falls to the right, Ching's Pond on the bottom. Ching’s Pond is a popular swimming hole with very cold water. Some people jump into the water off the side of the bridge. This is the first in a series called Trouble in Paradise. In recent years, the deer population has exploded on Maui. Deer on Maui? Really? I’ve heard deer stories on the mainland, about deer who wander into garden beds and eat all the tulips and rose bushes and vegetables, deer who eat all the young forest saplings leaving nothing but ferns everywhere. Bad, bad deer, who often can’t be hunted in residential communities. Maui doesn’t have a lot of tulips or rose bushes, but we do have a lot of deer wandering into farms and eating valuable crops or munching gardens at hotels and around houses. By the way, Maui farms tend to be small, 2-20 acres, smaller than most small mainland farms which are often 50+ acres. Also many hotels and resorts, part of the local food movement, have gardens. Our deer roam the island fairly easily, especially from high-up Kula and upcountry down to the beach area of Makena. I don’t know if there are deer in Lahaina or Ka’anapali, but I wouldn’t be surprised. Maui’s deer are an introduced species, not native to the Hawaiian Islands. Our Axis deer are generally smaller than mainland deer, with spots, and cute in a Bambi kind of way. They are sub-tropical deer, gone amok in paradise. The Axis deer population is estimated to be 60,000 deer, of which 90% are estimated to be does, and 90% of those female does are believed to be pregnant! Michael estimates that this summer, the deer population could reach 100,000. When there is drought, like we had in April, the deer get so hungry that they wander more into local farms and gardens, causing even more damage than they normally do. Summer time, especially in Kula and upcountry, can be very dry with extended drought conditions and water rationing. The MADHC formed as aresponse to the deer population explosion. For the last three months they have conducted a pilot project to do controlled hunts of deer on private property, with a USDA inspector, kill the deer quickly, transport and refrigerate them, and butcher them in a food safe manner at a USDA approved slaughterhouse. 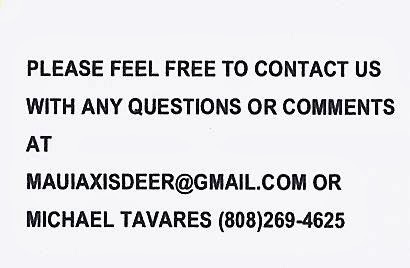 Maui Axis Deer Harvesting Co-op banner and a participating hunter at the Farmers Union meeting. So far 280 deer have been killed and the pilot project has been a success. The county/state has approved the program, and local venison will become available to buy at Pukalani Superette in a few weeks. Actually, Maui venison was expected to be in stores last spring, a year ago, but there were some snags in the process. Nothing is wasted: the meat is given to hunters and their families, also to approved low-income residents. The entrails are given to farmers to compost. If you’ve read The Omnivore’s Dilemma, you’ll recall that animal parts can be composted safely and create rich, healthy compost. The hides are given to deer tanners. Michael and other members of the MAHDC sat at a table during the meeting to answer questions and talk with local farmers and land owners. They have also been presenting at the Kula Community Association and other places. For those concerned about animal welfare and animal rights and who might question deer hunting, consider the alternatives. For example, tagging and spaying/neutering deer would be outrageously expensive. Deer also eat other things besides local Maui produce, like indigenous native plants. Some land on Maui is protected with big fences, but open areas are grazed by deer, goats and trampled by feral pigs. Some areas can be protected, but how many private landowners are going to fence their entire acreage? MADHC would love to have more access to hunt deer on private lands. Deer do not recognize land boundaries, so a herd of deer can keep moving. 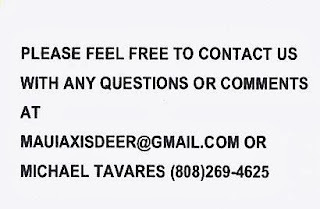 If you are a private landowner, please contact MADHC. If you’re a hunter, you can ask to join the MADHC. Keep in mind, MADHC has controlled kills, insurance, and a procedure in place. The deer are killed as cleanly and quickly as possible. I'm doing it this way so he won't get on spam email lists. Have there ever been this many deer on Maui? According to Michael, no. It’s never been this bad. Why are there so many deer now? 1. Lack of public/private hunting lands. 15 years ago, there was a lot more land available to Maui's hunters. Hunting actually held a more positive stereotype. So more land owners were willing to allow people to hunt on their lands. And I won’t say the problem was managed but there were a lot less deer. 2. Lack of habitat.... Maui has been expanding at an alarming rate. We have new hotels being built, multiple subdivisions, a lot of ag land that is being converted to business use. When this happens the wildlife that lives in these areas is pushed into new areas. 3. Also Maui provides the ultimate safe haven for a deer there are no natural predators, they have a warm tropical eco system that provides ample amounts of food and water put these two things together and you have the perfect climate for these animals to breed. How do you get these population statistics of 60,000? How is this being measured? Are there any deer ticks here? Deer are often associated with Lyme disease. Since the USDA is involved with the controlled hunts and meat processing, the venison available on Maui will be USDA certified and food-safe. I couldn’t help also asking Michael, “280 deer in 3 months! That’s a lot of deer. Where do you put all that deer?” He responded with a grin, “I have a really BIG cooler. You’d be surprised.” I can imagine. This is the first part of a series, called Trouble in Paradise. Stay tuned for more. An eco-village working group is forming. Fill out a survey at Upcountry Sustainability, and attend the next talk by Jashana on 6/19/13, 7 pm at the Pukalani Community Center. Also, on 6/25/13, the Maui Farmers Union will include a short talk by Dale Bonar, former director of Hawaiian Island Land Trust. The talk is on "affordable farm land and land trusts," which may be one way to develop an ecovillage on Maui. Jashana Kippert said this for shock effect in the middle of her talk on Eco-Villages on Maui: Fantasy or Possible Future hosted by Upcountry Sustainability. She pointed out that our grandparents knew how to do things – alluding to growing and homesteading, but that we don’t. She added that Cuba survived the embargo by asking the older generation how to do things, like plow with an ox. Note: These are my notes from the talk tonight. I could spend endless hours making this post more poetic or entertaining, but am choosing not to.. this is a more casual post. Jashana talked about going for her master’s degree and living in a dorm of 35 people. The first exercise was to figure out how to arrange the cooking of 3 meals, cleaning, and living together with 34 other people. Since it was a degree in anthropology/social ecology, the idea was to test some of the ideas in class by giving them a real life exercise in cooperation. She said her dorm spent hours discussing how much household budget could go towards coffee, a politically charged subject because of fair trade issues and the bloodshed going on in Guatemala at the time. One book mentioned by Jashana was Post-Scarcity Anarchism, a textbook classic. After graduate school, Jashana spent 7 years in Guatemala during the mass genocide, trying to move indigenous people through an “underground railroad” through a network of churches. Entire villages were slaughtered and tortured. Anthropologists recorded the methods of torture to trace to the generals who were schooled in those methods, and she said that the path traced back ultimately to the US who had trained these generals. She talked about doing skits in front of church audiences to convince them to hide villagers. Then she spent five years at the Findhorn Community in Scotland, a well known intentional community. She said the process involved some “endless long discussions” where everyone talked and got their issues out on the table, then meditated for 20 minutes, and they would come back to the table and often agree to a totally different path that was the opposite of where they were leaning prior to the meditation. She said it was powerful to see this process. Jashana went back to teach community building and other classes throughout South America, in countries like Argentina where she said the eco-village movement was helped in part by the government falling apart. She said there are eco-villages up and down the coast of Argentina, with the same vibe as Vermont hippie communities. She talked about the motivators for doing intentional communities or eco-villages. She mentioned the “fear path” in which you scare people into thinking doomsday is here, so they organize into an eco-village, but indicated she preferred the “vision path.” Per Jashana, the ends do not justify the means, and motivating people into forming eco-villages through scare tactics wasn’t how she wanted to go about things. Yet she also talked about what happens if the ships stop coming to Maui, and there are only two weeks of food supply for the entire island. Hunger is a powerful motivator. She said we aren’t nice when we’re hungry. We lose our “la-la-land” attitude and our politeness. She asked how much do any of us grow to live on, questioned US consumption levels, all the usual questions that one would expect at this kind of meeting, and then asked why people were here at this meeting. Was it curiosity – did we want to see pretty slides of eco-villages around the world, because she said she could certainly do that and would enjoy it. About 10 or so hands went up. Was it some interest in maybe forming an ecovillage on Maui, but without committing? Another 20 hands went up. Co-housing or shared spaces that also allow some boundaries. These types of communities are good to introduce people to the concept of sharing and making decisions together, while also giving people some space to be on their own. Eco-village. Jashana defines eco-village as a whole system of living that is somehow in relationship with the land/nature. I don’t have her exact definition. She moved on rather quickly. We left before her talk ended. At least going partly is an improvement from missing her talk completely last year, and being unsuccessful in reaching her via email or phone. Community is an ongoing and stimulating conversation. With all the hippies and sensitive new age types, aka “conscious creatives” on Maui, there is a LOT of interest in intentional community and eco-villages, as evidenced by the full room turn-out tonight. Jashana does seem real, she has lived in community, which is a contrast to people who fantasize about living in community. Jashana made several quips about the “endless long discussions” that can happen in community and how it is a form of meditation to ask one’s ego to step aside, and then politely ask, “Should we try another perspective?” DH has also visited countless intentional communities and eco-villages and nodded at several of her points. A friend of ours just moved back to the mainland, saying that he found more support and energy for intentional community in two weeks outside San Diego than in two years on Maui. The intentional community conversation has been going on for a long time. Late afternoon sand sculpture on Maui's South Shore, yesterday. It kind of conveys the hazy mellowness of summer on Maui. Updated 6/20/13: The Hawaiian Sailing Canoe, the Hokule'a is on Maui at Ma'alaea Harbor until 6/26. Then it goes to Laha'ina until early July. Canoe tours are open to the public from 9am - 12 noon and from 1 pm to 5 pm until 6/26 at Ma'alaea. This is a very informal list of events and opportunities that may be updated as I get to it. Often they are events that I might want to go to, or events that I think are worth sharing, or I don't want to plan something on a day there is a major event. There is some bias towards gardening, upcountry activities, low-cost or free events. Other good places to get local info on events: Meet Up, Flyers Up, Calendar Maui, Maui Time, A Maui Blog, EveryDay Maui. 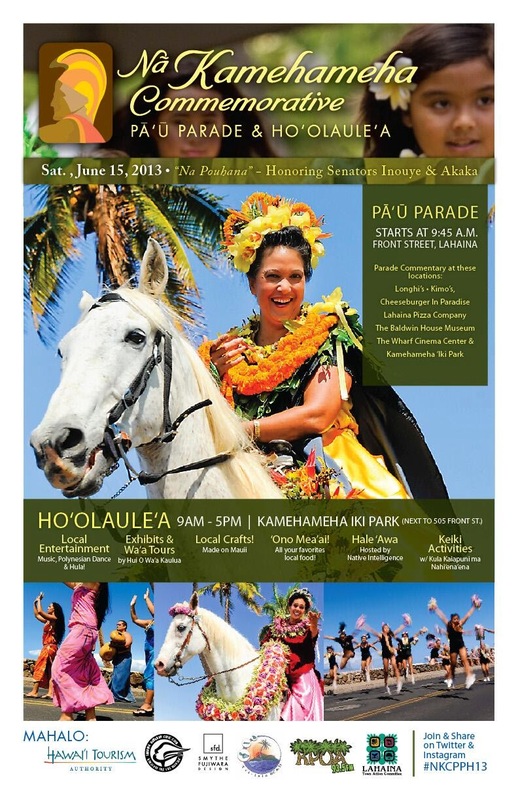 The Thursday Maui News has a weekend event calendar in their newspaper. Throughout June and July: Japanese Bon Dances or obon festivals - Calendar Maui and Maui Time often have good listings. They take place all over the island at different Japanese missions/temples. Oh, I just found a good obon schedule on EveryDay Maui. Through July 5th: Hui No'eau Art Center: Student & Faculty Salon. I usually enjoy going to their exhibits and have gone in the past. Monday - Saturday, 10 - 4pm. Makawao. 5/31 - 6/2 - Wa'a Kiakahi. Hawaiian Canoe Sailing event, free. Watch the races, get a chance to ride for 15 minutes on a sailing canoe and talk story. Ka'anapali. 6/1- Fruit Tree Orchard Design and Care. Two very experienced farmers are running this all-day workshop in Haiku. They may have another gardening workshop in the fall. 6/1 - Pi'iholo Zipline Kama'aina Day. Special $50 rate for adults, must be a resident of Hawaii. Here's my Z for Zipline post which talks about the several ziplines on Maui. 6/1-6/2 Hands on Beekeeping Class with Maui Bees. 3 hours each day. Basics to manage a hive of bees on Maui. Kula. 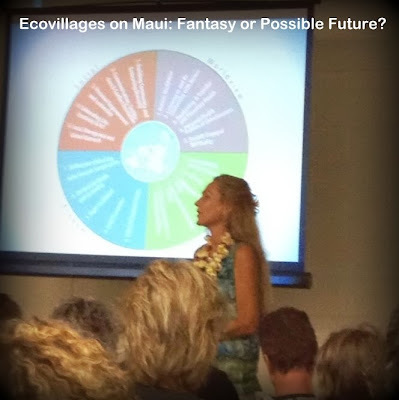 6/3 - Ecovillages on Maui: Fantasy or Possible Future? Upcountry Sustainability presents Jashana Kippert who will talk about possibilities for ecovillages (intentional communities) on Maui. 7 pm. Pukalani. 6/6 - 6/9 - Kapalua Wine and Food Festival. Kapalua. 6/7 - Hawaiian Taro Sale. More than 50 varieties of dryland and wetland taro will be available on Friday at Maui Nui Botanical Garden, 9 am to 4 pm, while supplies last. 6/7 - Wailuku First Friday Town Party. 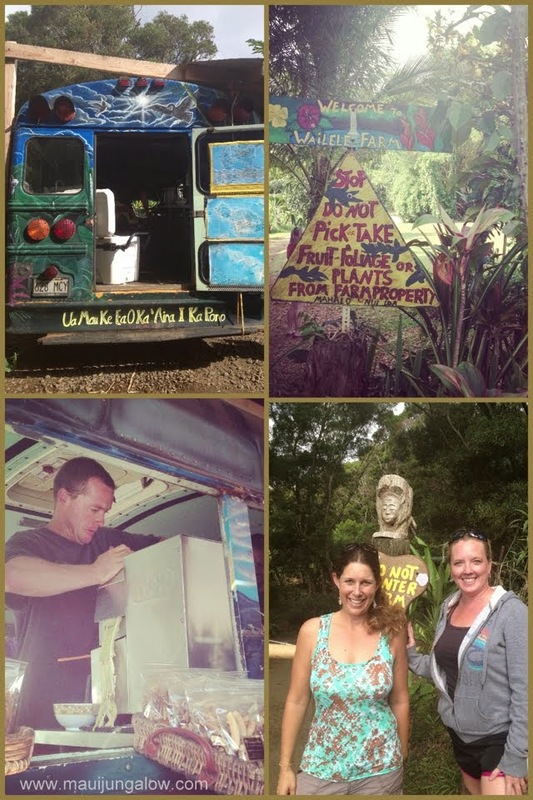 6/8 - Hana Supper Club, Second Supper - A new pop-up monthly dinner series in beautiful Hana, Maui. Intrigued. Reservations required. Sounds like Kupu Maui but in East Maui. 6/8 -6/9 Upcountry Fair Maui. 4H events, pie eating contest, local music, farm stuff. 6/9 - Huliau Environmental Film Festival. One night only, but there may be a second showing of environmental short films by talented Maui students. 6/10 - ONO (One Night Only). Maui Onstage present a reading of "First Love." ONO is usually the second Monday of the month. 6/10 - NEW DATE! 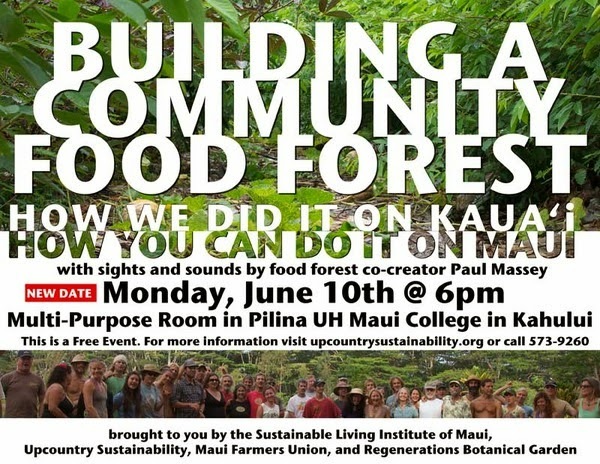 Building a Community Food Forest: How we did it on Kauai, How we can do it on Maui. Presentation by Paul Massey, Director of Regenerations Botanical Garden in Kilauea. 6 pm. Kahului, UH - Maui Campus. 6/12 - 6/16 - Maui Film Festival held in Wailea and the Maui Arts and Cultural Center. Big event. 6/14 - Lahaina Second Friday Town Party. 6/15 - 6/16 Kupu Maui Pop Up Feast, two separate events in different locations. Reservations through the website two weeks prior to the event. 6/16 - 6/26 - The Hawaiian Sailing Canoe, the Hokule'a, is at Ma'alaea Harbor. See the update at the very top. 6/19 - Eco-Village Working Group meeting at Upcountry Sustainability. 7 pm. Pukalani. 6/19 - Maui SMUG (Social Media Users Group). For this month only, they are meeting on the 3rd Wednesday, from 4-6 pm in Kihei. Usually it's the 4th week of the month. Allot extra time if you want to go to a restaurant to hang out and talk story after the meeting. I wrote about going to a SMUG meeting for the first time. 6/21 Art = Mixx Runway Event at the Maui Arts and Cultural Center, Wailuku. Free for 21 and older. They have done some amazing events. I have blogged about their Black + White event. 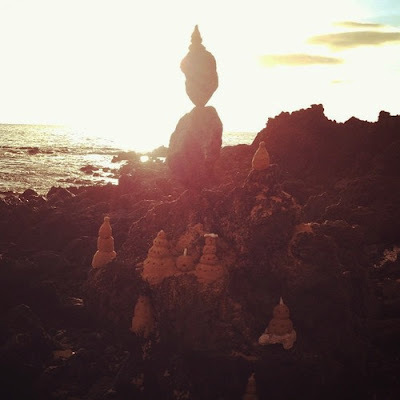 6/21 - Full Moon Labyrinth Walk, Sacred Garden of Maliko, Makawao. 6/22 - Down to Earth Grand Reopening, Kahului. Sale on 100+ items, plus live music by Paula Fuga, health lectures and cooking demos. 6/22 - Hali'imaile Community Garden Open House & Potluck Party. 2 - 4pm. Hali'imaile. 6/22 - Ham Radio Field Day at Ho'okipa Bluff, near Pa'ia. The public is welcome to learn about the mobile ham radio station. Read more about the Ho'okipa radio field day from last year. 6/23 Slack Key Guitar Festival. Free. Maui Arts and Cultural Center. Popular family event. 6/25 - Maui Farmers Union Potluck and Meeting - Haiku. 100+ people, with great speakers. Free. 6/27 - Art of Cooking with Essential Oils. 2 hour class to be held in Wailuku. 6-8 pm. Gluten free, organic and vegan dishes.$25. Contact Deborah Maghen for more info. 6/29 - Cycle to the Sun - The race for crazy cyclists from Paia to Haleakala Summit. Insane. Serious cyclists will have shaved legs, really. 6/30 - Ulupalakua Sunday Drive, Ulupalakua Ranch and the winery, 11 am - 4 pm. Live music, wine tasting and talks/walks about the area's culture.